The Xbox 360 Core System is everything you need to hit the ground running. Plug in the console and the controller and you're playing. Then decide what extras you add and when-it's expandable to the full Xbox 360 experience. • Hardware, software, and services: Fusing powerful hardware, software, and services, Xbox 360 fully engages you in a gaming experience that is more expansive, dramatic, and lifelike, where the possibilities are limitless and your imagination knows no boundaries. 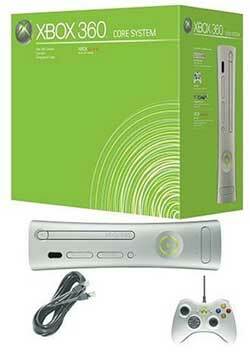 • Industrial design: A merger of form and function, Xbox 360 wraps powerful technology in a sophisticated exterior. • Xbox Gamer Guide: The Xbox Gamer Guide is an entertainment gateway that instantly connects you to your games, friends, music, movies, and downloadable content. • Personalized interface: Xbox 360 lets you create your own unique system and experience. • Ring of Light and Xbox Guide Button: Featured on both the wireless and wired controllers, the Xbox Guide button puts you in control of your experience. In addition to bringing up the Xbox Gamer Guide and the Xbox System Guide, the Xbox Guide button lets you turn the system on and off without ever leaving the couch. • Xbox Live: Xbox Live is where games and entertainment come alive, the only unified place where you can play with anyone, anytime, anywhere. And the best just got better. Connect Xbox 360 to your broadband connection, attach a storage device (hard drive or memory unit) and get instant access to Xbox Live Silver. Express your digital identity through your gamertag and gamer card, talk with others using voice chat, and access Xbox LiveMarketplace. • Xbox Live Marketplace: Keep your favorite games fresh with instant access to new content. Accessible to Silver and Gold members, Xbox Live Marketplace lets you personalize and extend your experience, on demand. • Games: Xbox 360 redefines what games look like, sound like, feel like, and play like to engage you like never before. Vibrant characters display depth of emotion to evoke more dramatic responses, immersing you in the experience like never before. See all Xbox 360 titles at 720p and 1080i resolution in 16:9 widescreen, with anti-aliasing for smooth, movie-like graphics and multi-channel surround sound. • Digital entertainment: Amplify your music, photos, video, and TV. Watch progressive-scan DVD movies right out of the box. Rip music to the Xbox 360 hard drive and share your latest digital pictures with friends. Make the connection, and Xbox 360 instantly streams the digital media stored on your MP3 player, digital camera, Media Center PC, or any Microsoft® Windows® XP 2005 Edition-based PC. **The Xbox 360 will be AVAILABLE on TUESDAY, NOVEMBER 22. ***The Sony Playstation 3 will be launched on May 15th 2006. Microsoft Xbox 360 Just Around the Corner!